'So good they named it twice' is a suitable epithet for this brilliant enterprise right beside Kinsale harbour. Since opening, it has become the town's celeb hangout: this is where the beautiful people come to eat incomparably fresh seafood straight from the local day boats. Fishy Fishy is a radical kind of place: it goes its own way, it doesn't serve meat (it doesn't need to!) and it doesn't accept bookings at lunchtime - but no one minds queuing when the food on the plate is so good. Note that they now take reservations for dinner. Since much depends on the haul, eating here is a flexible feast and menus are forever changing as supplies come and go. Among the delights you might find are gargantuan shellfish platters, incomparable seafood chowder, plates of oysters nestling on beds of seaweed, bowls of steamed mussels and clams, squid, John Dory, black bream ... the list goes on and on. The whole place has been designed with the kind of cosmopolitan acumen that might flatter a big-city venue, let alone a harbourside cafe. A fabulous continental-style courtyard is the main attraction with its decking, big parasols and artfully arranged beach stones, although the bright, airy interior has its own attributes. 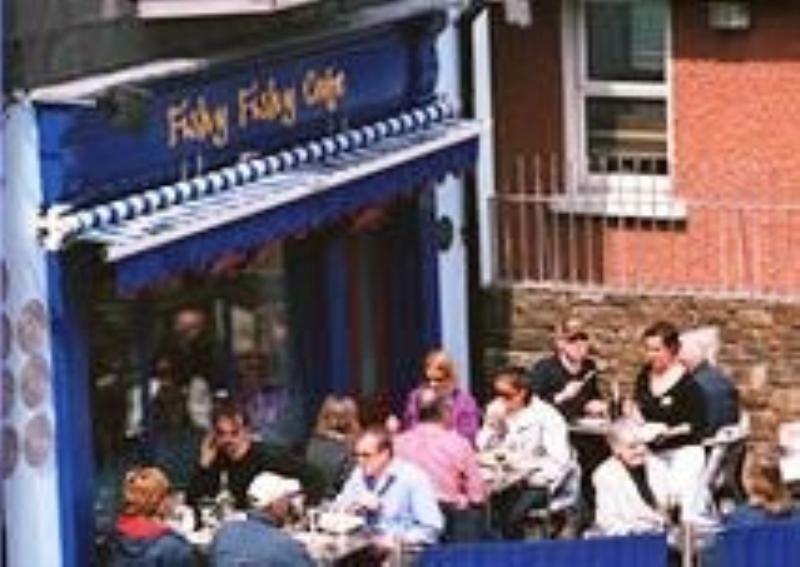 Across town, the original Fishy Fishy cafe/shop/deli is still doing great business at the Gourmet Store opposite St Multose church. Shellfish and tomato stock, flavoured with tarragon and coriander, finished with a mixture of local fish. Supplied by Jamie at Haven Shellfish, Oysterhaven. Cos lettuce, crisp croutons, caesar dressing, parmesan shavings. With fresh basil and lemon butter sauce. Sautéed monkfish, salmon and shellfish in a sweet chilli sauce served on a bed of mixed leaves. Chilled platter of local fish and shellfish served with homemade mayonnaise. On a bed of mixed leaves, potato wedges, parsnip chips, sweet chilli and roast red pepper dressing. White fish, salmon and shellfish cooked in a cream sauce topped with herb breadcrumbs and house mash. In tempura batter, served with homemade chips and tartare sauce. Pan fried scallops and Rosscarbery black pudding, creamed parsnip, lemon and thyme dressing. Steamed Lobster out of the shell, finished with a mustard sauce and house mash. Served medium rare with Basmati rice, honey, soy and sesame dressing. Basmati rice, spring onion tempura, sweet chilli, coriander and ginger butter. Crispy onion rings, brandy and blackpepper sauce. Served with vanilla Ice cream & warm chocolate mousse. Served with a passion fruit sauce. Served with boudoirs biscuit & Tia Maria scented mascarpone.